Clinical trials have proven the safety of NeuroStar TMS Therapy® in treating depressed patients who’ve had an inadequate response to prior antidepressant medications. Treatment with NeuroStar TMS Therapy caused few side effects and was generally well tolerated by patients. The most common side effects reported during clinical trials were headache and scalp pain or discomfort — generally mild to moderate and occurring less frequently after the first week of treatment. Over 10,000 active treatments were performed across all NeuroStar® clinical trials demonstrating its safety. There is a low risk of seizure with TMS Therapy. The estimated risk of seizure under ordinary clinical use is approximately 1 in 30,000 treatments (0.003% of treatments) or 1 in 1000 patients (0.1% of patients). Patients should be carefully monitored for worsening symptoms, signs or symptoms of suicidal behavior and/or unusual behavior. Families and caregivers should also be aware of the need to observe patients and notify their treatment provider if symptoms worsen. NeuroStar TMS Therapy should not be used (is contraindicated) in patients with implanted metallic devices or non-removable metallic objects in or around the head. 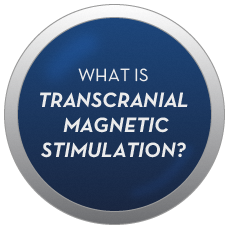 NeuroStar TMS Therapy should be used with caution in patients with implants controlled by physiological signals. This includes pacemakers and implantable cardioverter defibrillators (ICDs). 1. Janicak P, et al. Transcranial Magnetic Stimulation (TMS) in the Treatment of Major Depression: A Comprehensive Summary of Safety Experience from Acute Exposure, Extended Exposure and During Reintroduction Treatment.Journal of Clinical Psychiatry, February 2008. Clinical trials have proven the effectiveness of NeuroStar TMS Therapy® in treating patients with major depression who have not benefited from prior antidepressant medication. * In clinical trials NeuroStar TMS Therapy was studied in adult patients suffering from Major Depressive Disorder, all of whom had not received satisfactory improvement with previous antidepressant medication. In clinical trials, indicated patients had been treated with a median of four antidepressant medication attempts, one of which was at an adequate dose and duration. 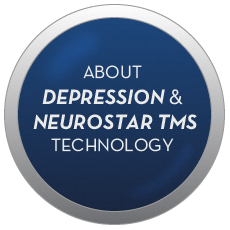 Neurostar TMS Therapy is indicated for the treatment of Major Depressive Disorder in adult patients who have failed to achieve satisfactory improvement from one prior antidepressant medication at or above the minimal effective dose and duration in the current episode. An Effective Option for Treating Major Depressive Disorder. 2. Demitrack MA, Thase ME. Clinical significance of transcranial magnetic stimulation (TMS) in the treatment of pharmacoresistant depression: synthesis of recent data. Psychopharm Bull. 2009, 42(2): 5-38.